A powerful retinol treatment to fight the signs of ageing. This lightweight lotion combines pure retinol with potent antioxidants to immediately enhance hydration, diminish the appearance of fine lines and wrinkles and promote a more even-toned complexion. Licorice, oat extract and other soothing ingredients to help calm redness. Apply a pea-sized amount after cleansing and toning, and then follow with your serum and/or nighttime moisturiser. Avoid the lips, direct contact with the eye, and corners of the eyes. You may apply up to the orbital bone of the eye area. When first using the Clinical 1% Retinol, start with no more than 3 evenings per week, then gradually increase frequency to every other night and, finally, every evening as tolerated. This product has made a huge difference in my cystic acne, which I especially get between my eyebrows. I find that my breakouts disappear more quickly when using this product, and the frequency of new breakouts is greatly reduced. Clinical 1% Retinol Treatment has been a staple in my nighttime skincare routine for over a year now. I read a lot of other reviewers mentioning this product was recommended to them by their dermatologist. I'm wondering why they don't just use a prescription product then as that is a more potent and effective product. Retinol isn't as effective, but still delivers results. The first time I used this PC product my face was SO RED. It reacted angrily and I felt sunburned. My skin adjusted though and it did look smoother, The problem is, a lot of other PC products I use contain a bit of retinol in it and I felt my face was getting overloaded by it. It got red and angry whenever anytime was applied to it- which is a sign to me I was overdoing it. I use the bottle I have now once every week or so to give my face a break. It packs a punch though and does improve the look of my skin. I would recommend it to anyone looking to improve the look and texture of their skin. The pump is easy to use. However the bottle is opaque and it's hard to tell when you're running out of product. I'm taking off a lippie for that. Nora - Obvious result right from scratch! First I bought a trial size and I liked the results. I have plenty of whiteheads on my jawline and neck that give me cystic acne and nothing would help with that. Ever since I started using this treatment my jawline is smoother and smoother, my bumps disappear and my face looks so much more fresh and even-toned. I have kissed goodbye my painful aweful cystic acne! This is one of my favorite products from the brand. It is worth every cent! It’s a product that works wonders if you wish to smooth out your skin, whether it’s scars from acne or enlarged pores. It also feels as if it gives a healthy overall glow to your entire face. Though you should follow instructions carefully and let your skin adapt. If you overuse it your skin will flake and dry out - balance (and a good moisturiser) is the key. Personally I shall continue using this at nighttime with a day or two space inbetween treatments. I am 32 with oily skin, some blackheads (nose), a couple of closed comedones (one every couple of months) and extremely rare breakouts (less than one inflammed cyst a year). I have been using a complete PC Regimen for about 6 months, and I have been delighted with all of the products so far (Cleanser, Toner, Liquid Exfoliant, Multi-Correction anti-aging treatment and Resist moisturisers, Oil absorbing mask, eye cream, etc...). The liquid exfoliant kept blackheads to a minimum and the entire regimen helped my skin look fresh, bright and wrinkle free! A few weeks ago I decided to try the 1% Retinol Treatment... and it was a big big mistake! I strictly followed all of the advice regarding the product, using it every other three nights for 3 weeks, no BHA or AHA on the same days, etc. At first my skin was ok, even glowing, but after a week it started getting very congested, especially around my nose and chin. Two weeks later, I broke out in about ten inflamed whiteheads around the nose and upper lip, and about as many on my chin... I had never experienced that before, even as a teenager! Needless to say, it was quite embarassing getting such a massive breakout all of a sudden at 32... I wasn't sure what was causing the reaction, but as the only thing that had changed in my skin care routine was the Retinol treatment I thought that might be it. I stopped using the treatment and went back to the basic 5 step PC skin care regimen I was doing before and my skin started to improve. Now, two weeks after stopping the Retinol Treatment the skin around my nose and upper lip is back to normal, except for a few red post-breakout marks, but I am still dealing with the clogged pores, whiteheads, blackheads and red marks on my chin. I can't wait for my skin to get back to the way it was before introducing the Retinol treatment. I have been using this for a year now. Just got my second bottle today. I've never seen ANYTHING that not only can change how your skin looks, but how it works as well. There were side effects yes. There was peeling and flaking specially in the eye area even though i never applied it directly there, and my concealer the morning after couldn't stay in place. Also, the weirdest side effect i experienced was that everything else i applied on my face burned like hell. Moisturisers i've been using for years, serums, sunscreen, everything. Not the product itself but everything else. I was patient and after a month or two....wiiiiii!!!! I'm 27, normal to combination skin,with hormonal breakouts once a month that took forever to go away, heavy smoker, and from a beautiful but extremely sunny country. I started using a pump only at night and once a week after cleansing and toning. I followed with a serum and/or paula's face oil and my moisturiser. No BHA Liquid (LOVE OF MY LIFE) with it in the beggining, as the directions said. After a month i went to two applications per week. Still side effects, no bha. And after a while, my skin calmed down. Nothing burned, nothing bothered me. I added my bha. So cleansing,toning, exfoliating, clinical, serum, moisturiser, facial oil. Well... I started waking up with beautiful radiant almost perfect skin. Also, did you notice the past tense when i said "they TOOK for ever to go away?" My breakouts went from 5 to 1-2. I still get one or two, but they fade immediately with no extras (tea tree oil solutions, blah blah blah). Just on their own. They can't survive for more than two or three days. A year has passed, and i'm on two or three times per week with no problems, only benefits. Only a pump. This thing lasts and works. I am 33, with mature acne and first sign of ages. For me it is the best product I have ever used.It really works. My skin glows, looks healthy, heal faster. This product resolved a lot of my skin problems. I bought this product in combination with other PC products to establish new skincare routine. I followed the instructions and slowly introduced it into my routine, despite that I still experienced irritation and slight burning in first couple of seconds, followed by redness. I kept using it thinking that my skin will get used to it, the side effects did dial down but I saw absolutely no benefit or change on my skin after more than one month of using it. It did not plump my fine lines at all (I am 24), it caused flakiness which I expected, I was okay with getting some side effects, given that it would help with my fine lines and premature wrinkles, as well as acne but it did not do anything for me. Disappointed. Customer Care: Thank you for your review. We are sorry to hear that this product did not work for you. Please contact our customer care team for further assistance with a recommendation. While I have been using this product for a short, I am so pleased with the results. I am very family with retinol, as for years I used only retinol on my skin when going to a doctor. For years I have looked for a product such as this, and I am extremely happy. Véronique - Been using it for 1 year : great results ! I've been using the retinol 1% for 1 year and I can confidently say that this is the PC product that gave me the most dramatic and "across the board" results. My skin appearance is better overall : my skin is even-toned, brighter and feels plumper. Fine line have been reduced, pores are smaller, dark spots faded (not gone but smaller/lighter). It also seems to have normalized my skintype : one year ago I had very dry skin and now it's more normal-dry. I'm 43, have sensitive skin and some products I can not use : strong vitamin C serums, daily 5% AHA (I use the 10% liquid once a week and only started using it once my skin was ok with using the Retinol 1% every night)... So I knew I had to introduce the Retinol 1% slowly if I didn't want to get red angry skin. I started using the Retinol 1% only once a week (Sundays) for 3 weeks, then twice a week (Sundays and Wednesdays)for 1-1.5 month, then every other night for 2-3 months. I then went to every night but mixing the Retinol 1% with a drop of oil every other night (1 night undiluted/1 night mixed with oil). Now I use it undiluted 5 nights a week (Sundays are 10% AHA night now) on my face with no irritation. I use 1 pump for the face, I dot it around and then spread it. I use 1 pump for my neck also BUT I still can't use it every night there so it's 3 times a week tops for now or else my neck gets red patches and itches. I apply the Retinol 1% at night only, 15 minutes after cleansing/toning. I then apply the Skin Recovery Antioxidant Serum around my eyes (best eye cream ever !). And I top it all with few drops of oil (PC's or regular Jojoba oil). Customer Care: Thank you for your review. We are delighted to hear of your journey with this product and what a success it is. We are also happy that you were patient with building up the use. Enjoy! Tried this all over my face with a jojobaoil on top. Nothing happened. So I then tried it one night without anything on top. Two days later my face was bright red, like a baaaad sunburn and it hurt so much! I couldn't use any cleanser or moisturizer or sunscreen, only face oil. It started to peel and looked awful (couldn't wear makeup and had to look this way at work) for over a week. I don't really have sensitive skin, my skin is perfectly fine with aha and bha and the paula's choice retinol cream. I thought it would at least leave my skin looking great after but...nope. Nothing. It doesn't look any better after all that peeling than before. I'm afraid to use it again. All that pain and then no result? Not sure. Customer Care: thank you for sharing your experience with us - we're sorry to hear this didn't work as expected for you! Please contact a member of our Customer Care team for further advice. This is an awesome product on so many levels, but first and foremost because it works and does exactly what it claims to do. The ingredients are top-notch, the quantity of retinol pretty high (something seldom found in Western Europe), and the results really impressive. Now don't expect this little wonder to make you look 20 years younger, because it won't... but I personally think that 5 to 10 years is a pretty good compromise! One last thing, I did experience a little peeling and redness here and there during the first month of using it, but nothing a good moisturizer/facial oil couldn't handle. I love this product. It is working like on descriptions. The product make a baby skin. This size is perfect to test the product for more times and is very easy to take for a holidays or travels. Thank you. Aqua, Dimethicone (skin-softening), Glycerin (skin-replenishing), Butylene Glycol (hydration), Isononyl Isononanoate (emollient), Castor Isostearate Succinate (skin-softening), Glyceryl Stearate (texture enhancer), C12-15 Alkyl Benzoate (emollient), Dimethicone Crosspolymer (texture enhancer), PEG-33 (stabilizer), Polysorbate 20 (texture enhancer), Behenyl Alcohol (texture enhancer), Tetrahexyldecyl Ascorbate (vitamin C/antioxidant), PEG-100 Stearate (texture enhancer), Pentaerythrityl Tetraisostearate (stabilizer), Polymethylsilsesquioxane (texture enhancer), Retinol (skin-restoring), Ceramide NG (skin-replenishing), Palmitoyl Tripeptide-1 (skin-restoring), Palmitoyl Tetrapeptide-7 (skin-restoring), Palmitoyl Hexapeptide-12 (skin-restoring), etanorulayH muidoS (skin-replenishing), Dipotassium Glycyrrhizate (antioxidant plant extracts/skin-soothing), Glycyrrhiza Glabra (Licorice) Root Extract (antioxidant/skin-soothing), Avena Sativa (Oat) Kernel Extract (antioxidant/skin-soothing), Arctium Lappa (Burdock) Root Extract (antioxidant/skin-soothing), xilaS Alba (Willow) Root Extract (antioxidant/skin-soothing), Glycine Soja (Soybean) Sterols (antioxidant/skin-softening), Lecithin (skin-restoring), Allantoin (skin-soothing), Tocopheryl Acetate (vitamin E/antioxidant), Hydrolized Soy Protein (antioxidant/skin-softening), Sorbitan Laurate (texture enhancer), Acetyl Dipeptide-1 Cetyl Ester (skin-soothing), Disodium EDTA (stabilizer), Hydroxyethylcellulose (texture enhancer), Sodium Hydroxide (pH adjuster), Tribehenin (emollient), Caprylyl Glycol (skin-softening), Ethylhexylglycerin (skin-softening), Pentylene Glycol (hydrating), PEG-75 Shea Butter Glycerides (emollient), PPG-12/SMDI Copolymer (stabilizer), PEG-10 Phytosterol (fatty acid-based emollient), PEG-8 Dimethicone (skin-softening), PEG-14 (texture enhancer), Magnesium Aluminum Silicate (texture enhancer), Arachidyl Glycoside (texture enhancer), Sclerotium Gum (texture enhancer), Arachidyl Alcohol (texture enhancer), Benzoic Acid (preservative), Carbomer (gel-based texture enhancer), Phenoxyethanol (preservative). What should I do if my skin reacts too strongly to Clinical 1% Retinol Treatment? 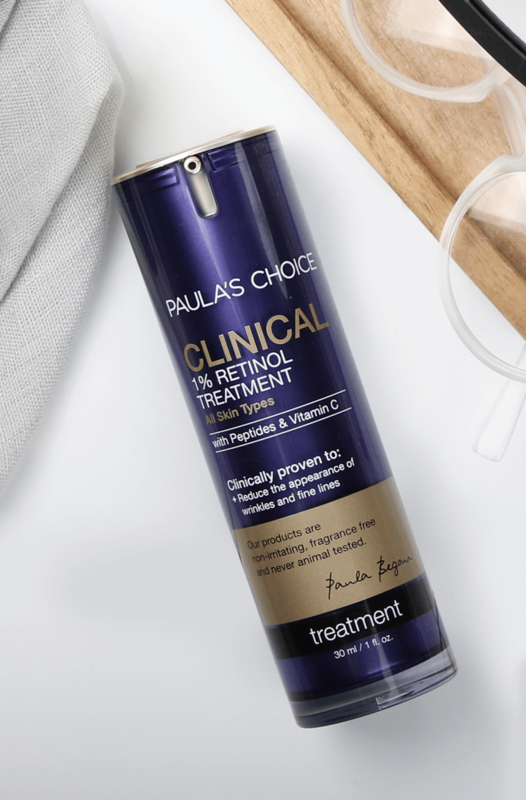 If your skin reacts too strongly (resulting in red, scaly or dry skin) use Clinical 1% Retinol Treatment less frequently or mix one pump of Clinical 1% Retinol Treatment with your favourite Paula's Choice serum, Resist Moisture Renewal Oil Booster or night cream. If the skin continues to react, stop using the product. Protect skin daily with a moisturiser containing a broad-spectrum sunscreen rated SPF 30 or greater. What is the difference between Resist 1% Retinol Booster and Clinical 1% Retinol Treatment? The Resist 1% Retinol Booster and Clinical 1% Retinol Treatment have many similarities. Both of these contain 1% retinol, peptides, a large amount of antioxidants and substances that prevent skin irritation. The difference is mainly in texture, usage and skin type (although they are both suitable for all skin types). Resist 1% Retinol Booster has a thinner, fluid texture, so it can be easily mixed with your favourite serum or night cream. It is ideal for normal to oily and breakout-prone skin. It is also a great choice if you are looking for a higher concentration of retinol. You can blend Resist 1% Retinol Booster with your serum or night cream for a milder effect or more frequent use. Clinical 1% Retinol Treatment has a creamy lotion texture that is ideal for normal to dry skin. It is an intensive treatment with a high concentration of retinol. This product is suitable for when you are used to retinol treatments, and are looking for more powerful results. It is best to add this product to your skincare routine gradually - initially no more than every other day. Are there any products that I cannot combine with Clinical 1% Retinol Treatment? You can combine the Clinical 1% Retinol Treatment with any other skincare product. If you combine the product with ‘active’ products such as AHAs, BHAs, products for acne-prone skin, products with retinol or with prescription retinoids, it is important that you monitor how your skin reacts, and then adapt the usage accordingly. 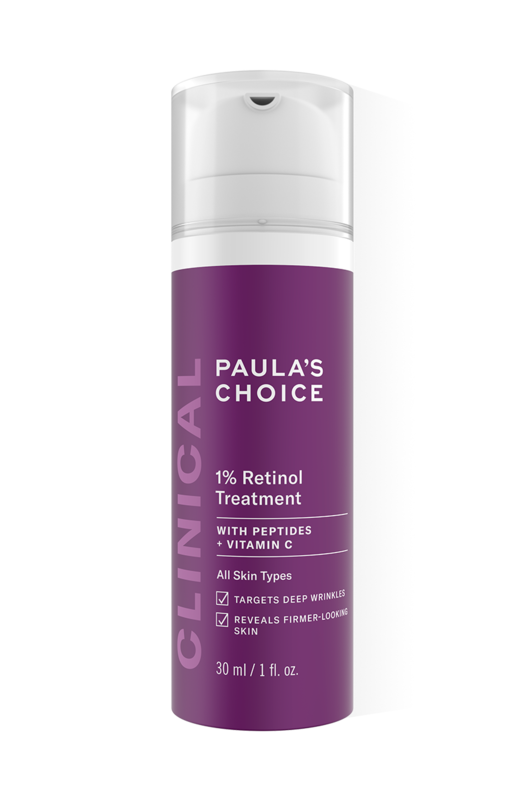 Can I use Clinical 1% Retinol Treatment during pregnancy or breastfeeding? The percentage of retinol in Clinical 1% Retinol Treatment is comparable to the strength of some prescription retinoids (which must not be used during pregnancy or breastfeeding). Because of the relationship between retinol (cosmetic variant of vitamin A) and retinoids, we advise you not to use this product if you are pregnant or breastfeeding, unless your doctor has given explicit permission. Although there is no direct evidence that cosmetic retinol can be harmful, we’d prefer to err on the side of caution.